The perfect country cottage! Set deep in the wooded Sussex countryside which gave inspiration to Elgar, this delightful 15th century cottage bursts with beams and character. Fowlers Cottage (all of property shown) enjoys considerable wildlife and easy access to excellent walking and many nearby attractions. Within half an hour's drive are Petworth House (N.T. ), racing at Goodwood, Arundel Castle, and elegant Chichester, with its fine shopping, restaurants and cathedral. 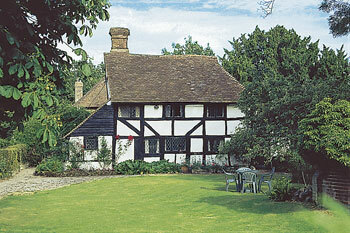 The Singleton Open Air Museum and the sandy beach at Climping are both within 16 miles. Riding, golf and tennis locally. There are many excellent pubs and restaurants in the area. Nearest inn and shop 2 miles. Three bedrooms. Entrance hall. 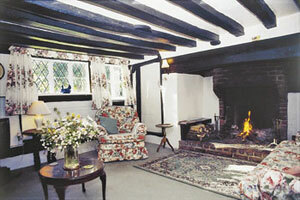 Charming sitting room with open fire in inglenook fireplace and electric fire. Well equipped kitchen with dining area and walk in larder. Single bedroom. Bathroom. Cloakroom/W.C. First floor: Double bedroom with wash basin. Single bedroom.